Obviously it's easy to criticise (mostly because it's rubbish; facile, arrogant, and shockingly badly designed). But you've got to applaud the bloke's energy and enthusiasm. And at least he's trying to move the debate about brands forward. It's just unfortunate that he's moving it forward from some point in the late 80s. Not only that but when you actually try to confront the guy, which I did via email, he fails to come up with a proper reasons for his face-value theories. On the enthusism front thhough, you gotta give it to the guy, he always answered his emails himself. Too bad there just wasn´t much in them. Take it from me, he's regarded as a joke figure even by those with Saatchi and Saatchi. But to his eternal credit he put Dave Droga at the helm of the Charlotte Street office which resulted in the agency eventually winning Cannes Agency of the Year. The first time I came across with Kevin's "LOve Marks" micro-site (a few months before the book's release) I thought to myself "there's another visionary character without a practical sense of reality". Well .. but when you don't play along with the others what do you do? You try to change the rules of the game. That's what Kevin Roberts is trying to do (me reckons). He definitely feels like a force for good. I can see why he's running an agency. I bet he's a brilliant salesperson who really pours his heart into his work. And I like his willingness to come out and use non-marketing words like 'love'. It's just that every time he says something good he undermines it with something dumb. He talks about the importance of design, yet the book is full of horrible design cliches like mocked-up post-it notes and the worst stock photography. And it's full of careful little elisions which give the impression that Saatchi's did all kinds of stuff they didn't do. And there's all kinds of stuff about how great Kevin's life is and how great his apartment is and how smart he is and how great P&G are. And yet. And yet. I want to hate it, but I can't. I can imagine that this energy and guts could be fantastic if tied to someone with genuine imagination and strategic nouse. And frankly, if Kevin says stuff like this people, especially clients, will pay attention. If some schmuck like me says radical and interesting stuff, who's going to care? HOW DO I KNOW A LOVEMARK? "Lovemarks transcend brands. They deliver beyond your expectations of great performance. Like great brands, they sit on top of high levels of respect - but there the similarities end. Lovemarks reach your heart as well as your mind, creating an intimate, emotional connection that you just can’t live without. Ever. Take a brand away and people will find a replacement. Take a Lovemark away and people will protest its absence. Lovemarks are a relationship, not a mere transaction. 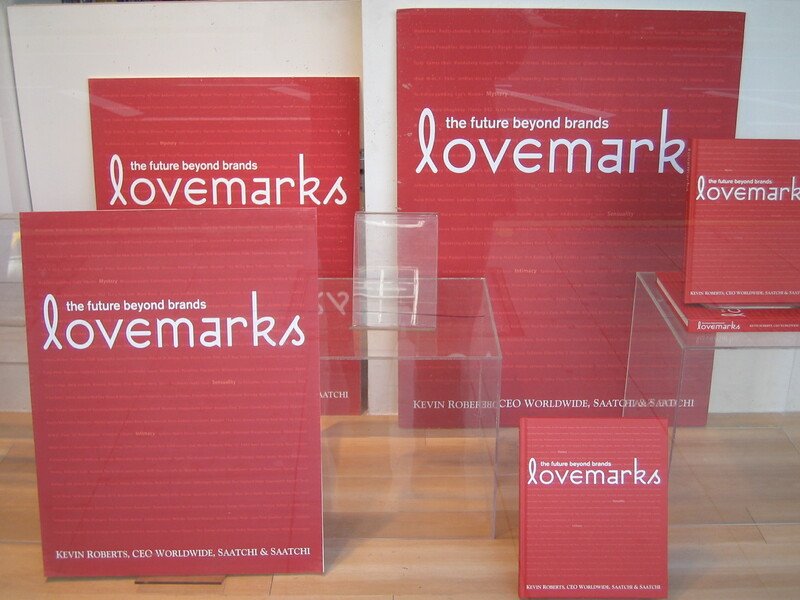 You don’t just buy Lovemarks, you embrace them passionately. That’s why you never want to let go." Hmmm .. right, almost poetic. Sorry if I'm being a bit sarcastic, but I can't buy "it". Especially Kevin's notion of "loyalty beyond reason" sounds a bit tyrannical. Nevertheless that are indeed brands that have that kind of emotional persuasive force, for ex. Harley-Davidson and its tatooed community. "In 1987 Roberts was appointed President and CEO of Pepsi in Canada. It was there that he famously machine-gunned a Coca-Cola vending machine in order to remind his people of the passion they need to be Number One in a competitive market." -- uauu he what? he machine-gunned a Coke vending machine?